"Between last night and this morning, I've been getting a lot of messages from overseas fans along the lines of 'There's an American comic ripping off Bleach!' I'm not that good at English, but I looked at the site and it seems it's a comic by Nick Simmons, the son of Gene Simmons. 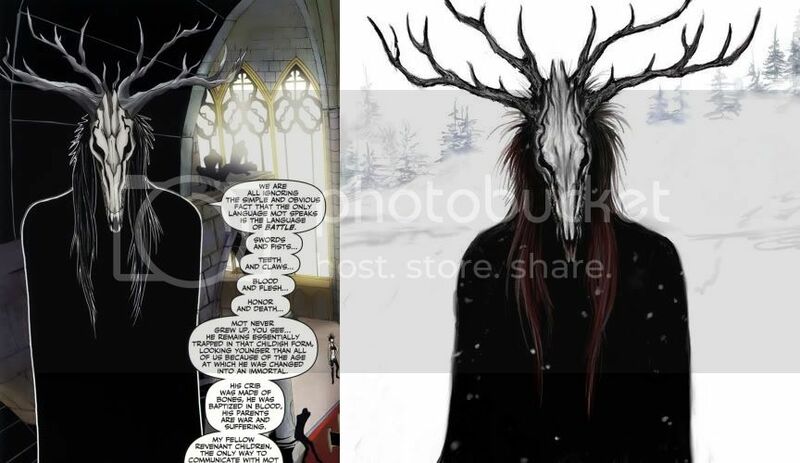 To be honest, I'm more bothered by the fact that Gene Simmons' son is a comic artist than whether or not it's a rip-off..."
— Tite Kubo, creator of Bleach, when asked about Incarnate's plagiarism accusations. Incarnate is the story of the Revenants, vampire-like monsters who call themselves by the names of Egyptian gods, who eat humans. Two Revenants, Mot and Connor, are kidnapped by an anti-Revenant organization called Sanctum. Are they used as living weapons or experimented on? No, they're equipped with death collars attached to their spines and given as playthings to Sybil, the daughter of Sanctum's head. It takes Connor about one page to develop Stockholm Syndrome, and Mot isn't far behind. Naturally, the other Revenants aren't pleased, and Sanctum's recently found a way to kill those same Revenants. 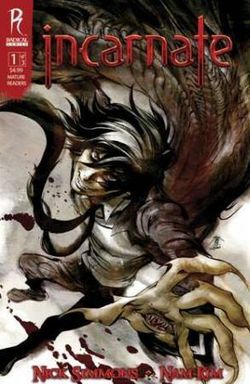 On the internet, the series is probably best known for being accused of plagiarizing characters, concepts, and line-art from several other works , especially Bleach. Due to these accusations the series' distribution was halted after three volumes. Aerith and Bob: Mot And Connor. Anti-Hero: Mot is at least a Nominal Hero. Author Avatar: The similarities between Mot and Nick are noticeable. Blood Knight: Mot is explicitly stated to be a gore-loving mass murderer. Vincent also shows clear signs of this. Boy Meets Girl: Mot and Sybil. Captain Ersatz: One of the main accusations faced against Incarnate is how its characters look and/or act like almost direct copies of existing characters from manga/anime series. As an example, the character seen here ◊ looks like an amalgam of Greed, Alucard, and Crocodile. Furthermore, Grynn ◊ looks exactly like another Deviantart picture, as seen in the image. Cut Short: Amid accusations and evidence of plagiarism, Radical Comics immediately shelved the series. Damsel in Distress: Not a single panel when Sybil isn't being saved, or crying, or being scared. Expy: Mot is one of Alucard, and Sybil of Orihime Inoue. Mot himself looks a bit like L and Teru Mikami on the cover. Vincent is the guy that looks like Kenpachi Zaraki, except with spikey white hair, a scar on his eye, a gigantic scythe and a trench coat. The white wolf looks like Kiba. Ripley has the same smirk, teeth and lanky frame as Shinji Hirako, with a few of the same mannerisms. Eyes Do Not Belong There: All over the body, no less . The only one that has more is probably Alucard. The Faceless: Grynn is this, with an assortment of masks in his cloak to boot. Even when he's changing masks his hair obscures his face. Jerk with a Heart of Gold: Sybil implies that Vincent is one, however, he had yet to follow up on this before this series got the axe. Our Vampires Are Different: Seems like the Revenants are vampires. Smug Snake: Ripley would fit this to a T, but because the majority of the cast are a bunch of Jerkasses, any character that cracks a cocky grin is this. Token Good Teammate: Ellie, who is the only revenant to actually be civil in her dealings with Connor. Villain Protagonist: Mot and Connor, in particular. Why Won't You Die? : Said by a Sanctum soldier to one of the revenants.